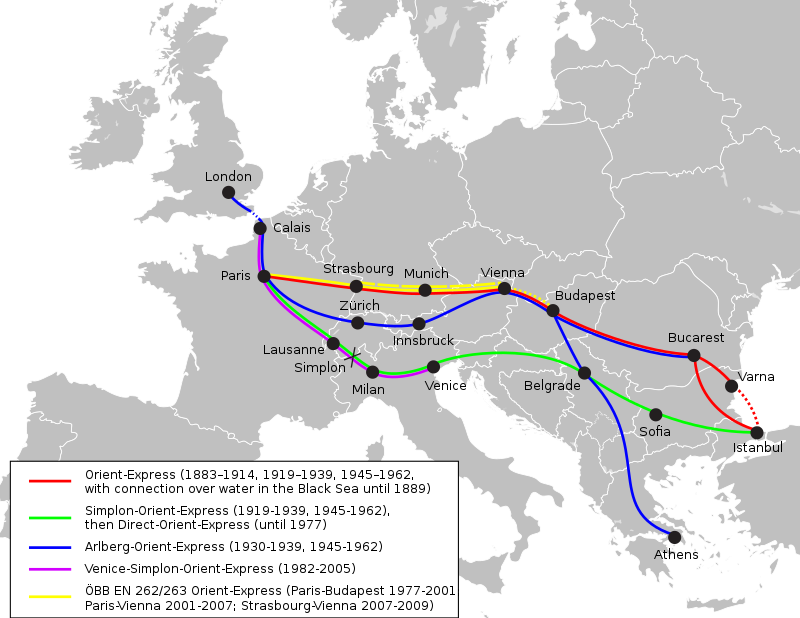 We decided to take a train across Europe, and the classic Orient Express Route really appealed to us. Starting in Istanbul, Our trip would take us to Bucharest, Budapest, Vienna, Zurich, Strasbourg, Paris, and finally on to London, where we would fly home. This was a start of a new dimension in travel for me: flying in to one city, traveling overland to another, and flying out of a different place. It was often much cheaper to do this than I realized, sometimes even a little less than the cost of round-trip airfare from the first or second city. We would go on to take many more trips inspired by that. The route we took is basically pictured above in red, (map by Wikipedia), although we did skip Munich to cut down to Zurich so we could visit a friend. We did not buy any train tickets in advance, partly because doing an 'official' Orient-Express train is extremely expensive and you don't have a lot of control over the route or the stops. Instead we decided to try to stick to a timetable that made sense for us if we were to get to London in time, and if we felt time was getting too tight, we could fly to London instead. We didn't have to do that in the end, and we were able to spend time in all the cities we really wanted to visit, overnighting in Istanbul, Bucharest, Budapest, Zurich, Paris and London. I was also able to just book our hotels while we were en route because the internet is awesome, and we were able to just get our onward tickets upon arrival at each city where we left the train for a hotel. Our plane landed in Istanbul. It is a city I liked as soon as I saw it. It is both ancient and modern, and there is a great mixture of influences at work there. We had a little trouble at our hostel; they could not find our reservation. 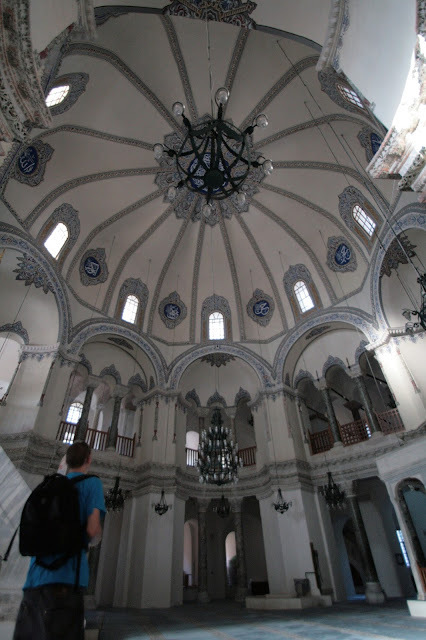 Instead of just leaving us to fend for ourselves, they made arrangements for us to stay at another place, Blue Eye Suites, which turned out to be really nice apartments in a historic Ottoman mansion and just a few blocks from the Haga Sofia. The hospitality was fabulous. The many mosques are gorgeous to visit. 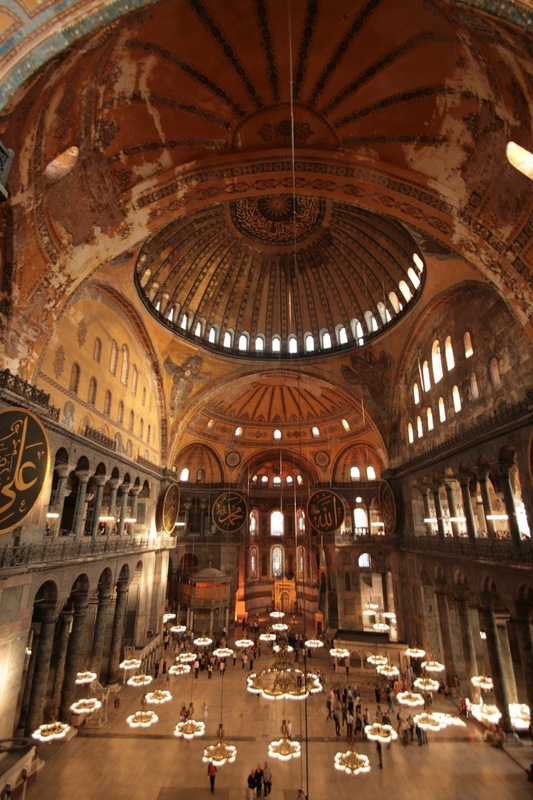 The Haga Sofia is one of the world's most famous mosques and it is stunning. 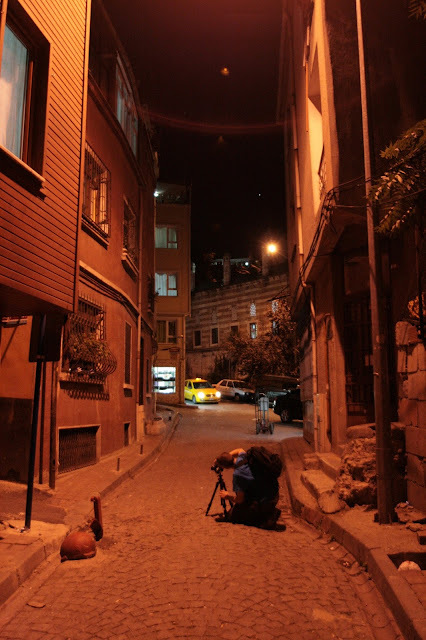 Istanbul is another great walking city. The main market is huge and really fun to walk around. There are many sites, including the Basilica Cistern, pictured above. Below is one of the Medusa heads in the cistern; why they are upside down is the subject of debate. Sultanahmet is a great neighborhood. In Istanbul, you can take a ferry to another continent, since Istanbul's Golden Horn, basically their harbor, straddles Europe and Asia. This is a fun little ride. The train station on the other side of the Bosphorus Strait, Haydarpaşa Terminal, is lovely. I'd like to explore more of this part of the city in the future. 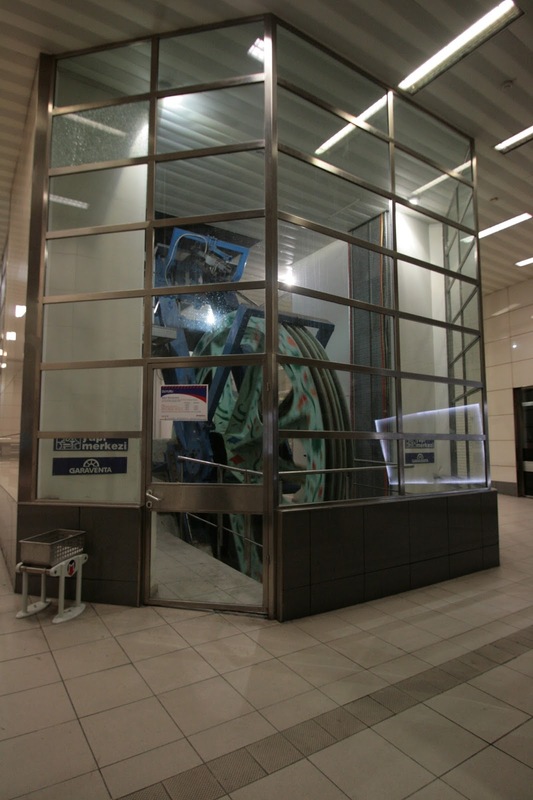 Istanbul also has a funicular, Kabataş–Taksim funicular. 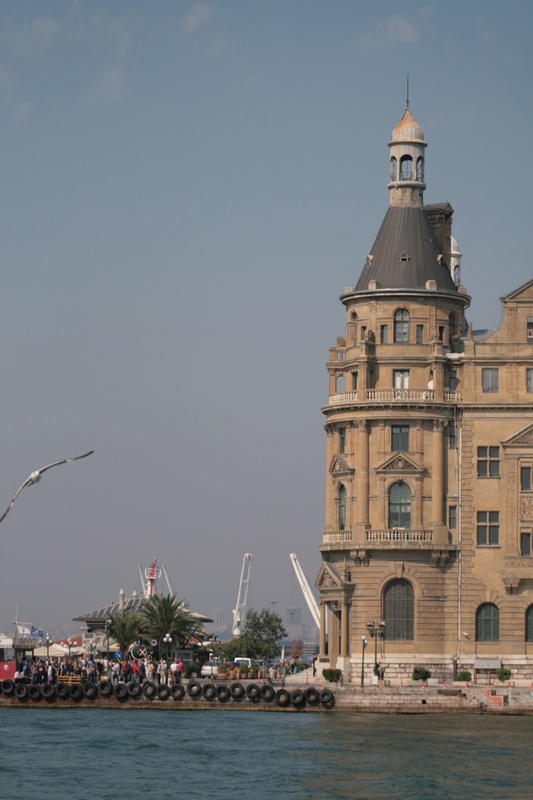 As our time in Istanbul was drawing to a close, it was time to get snacks and head to the Sirkeci Train Station and begin the next leg of the journey.